You’re busy. Between work, the kids, the meals, and the errands, you just don’t have time to clean that kitchen. After today’s article, you’re likely going to make time. The kitchen is where the entire family gathers to spend time together. Have you considered gathering around the toilet? Because that kitchen sink can have 100,000 more germs than the family throne. Ready to reach for the mop? We thought so. Here are 8 tips for tackling your dirty kitchen. 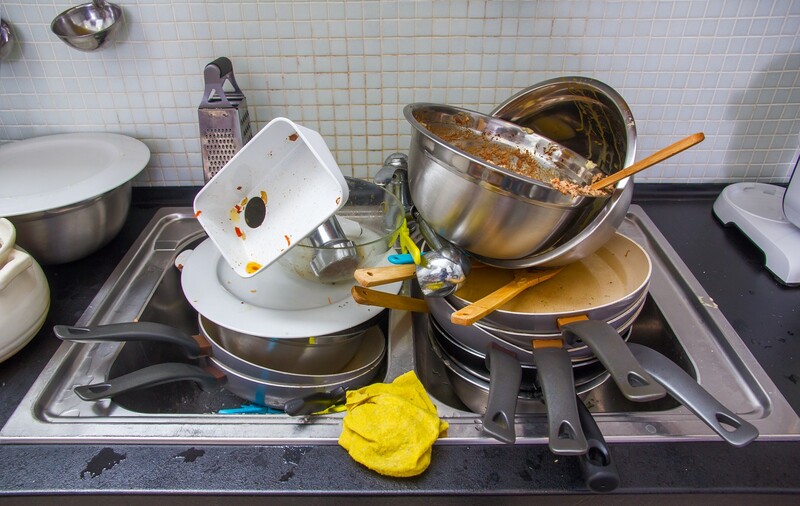 When was the last time that you cleaned the top of those cabinets? There is a ton of nastiness up there. Dead critters, dust, and rodent droppings are the usual suspects. Those vermin and their droppings can carry a virus that affects humans and our respiratory systems. Clean the top of your fridge and cabinets before moving on to other projects. This will allow you to form a nice collection of dirt that can be cleaned all at once. Speaking of respiratory issues, check every nook and cranny for mold as you clean. If you have an especially dirty kitchen, chances of seeing mold growth are pretty good. If you find this pesky fungus in your cabinets or other moist areas, always take the proper precautions. Wear a mask and gloves. A little bleach goes a long way. Use an old toothbrush for those hard to reach corners and wipe away the nonsense with a damp cloth. Use an old toothbrush for corners, and wipe away everything with a damp cloth. Use glass and metal containers to protect your food from insects and vermin. This is crucial in order to protect the health of your family. Proper food storage is critical. Are you guilty of putting that marinated raw chicken on a shelf above your produce? Sounds like a recipe for disaster to us. Cover your food and keep it in the right container. Avoid plastics when possible, and even steer clear of metals when storing highly acidic items. If there is ever a question, glass or Pyrex are the way to go. Kids like making a mess. We know. As soon as you’re able, you need to clean it up. Allowing these messes to sit around in a dirty kitchen will increase the chances of foodborne microbes popping up all over the place. Kids will stick their little paws into pretty much anything. This goes for you, too. Don’t just clean the kitchen. Make sure your kids are washing their hands. Also, wash your own hands, and wash any raw food like produce before you eat it. Bacteria and harmful chemicals are invisible. Don’t take chances. Little feet and big feet alike carry in filth from all over. Your husband or wife bring in dirt from outside, their jobs, and anywhere else they’ve been walking around. This is the fastest way to turn a clean room into a dirty kitchen. So, sweep every single day — even if you don’t have time to mop. Just getting rid of the excess dirt with put you into a cleaning routine. Plus, it will keep potentially hazardous or pest drawing substances out of your house. As mentioned earlier, the kitchen sink can be a truly disgusting place. So how do you get it clean and keep it clean? This is a place where family members not only wash their hands and food, but also clean dirty dishes. Why do we clean parts of our body and food in the same place where we leave filthy dishes and silverware? It doesn’t make much sense, but most people really don’t think twice. This leads to an even greater number of germs. Wash your dishes before starting on any meal prep. Wash your hands before and after individual tasks. For cleaning the sink itself, hot soapy bleach water will do the trick. Bacteria and other microbes need several things to survive. The human body contains all of the necessary ingredients for these organisms to thrive. One of the major issues is moisture. Specifically, water. After your clean your sink, make sure to wipe it down with a dry towel. Then, throw said towel in a dirty linens bin. Here are a few tips for washing dishes that you probably haven’t thought of. This is every teenager’s least favorite hobby. Maybe they don’t truly understand how they are helping everyone in the house? Not only do vermin and other pests like to go through trash for snacking purposes, it’s also a great place to mate. Aside from that, who wants to visit or live somewhere that smells like garbage? Keep your towels separate. What we mean by this is that you should have designated towels for cleaning and hands. Wiping your hands on a towel that you just cleaned with is not just going to put chemicals on them. Any bacteria or microbes that are still present are now back on your hands. They can also jump on anything you touch. This includes your food and children. Some people prefer paper towels for one purpose or the other. More frugal folks are typically going to go after shop towels and cloth hand towels. This is fine, as long as you wash them often. Keep the soiled cloth away from kids and pets. We’ve given you eight tried and true methods for taking your dirty kitchen and transforming it into a clean and safe environment. We appreciate you taking the time out of your busy day to do it — even if some people in your house might not notice. If you’re in the Panama City area and you think your job might be too tough for one person, contact us. Using the power of steam, All Star Steam Cleaning is here to help keep your kitchen (and other rooms) sparkling.